As first conceived, the XO Laptop display used LCOS (liquid crystal on silicon) in the form of a projector. Nicholas Negroponte demonstrated the concept in early 2005, using a set of black sticks sliding across a frame to convey some sense of how the folding optics would work. The laptop began to evolve in June of that year, when Mary Lou Jepsen, newly named as acting CTO, began considering a dual-mode display: one a conventional color LED laptop screen, the other a sunlight-readable, black-and-white e-book. The concept made abundant sense for the developing world, where outdoor classes are common and the cost of shipping textbooks is a major expense. At a July board meeting, Design Continuum presented an array of innovative prototype designs that would lead, by November 2005, to the famous "green machine", with its distinctive pencil-yellow crank, which was unveiled to the world by UN Secretary General Kofi Annan at the World Summit on the Information Society at Tunis. The yellow crank, while cute, in the end proved impractical; it migrated to the AC adapter as it also morphed into one or more other types of human-power devices. 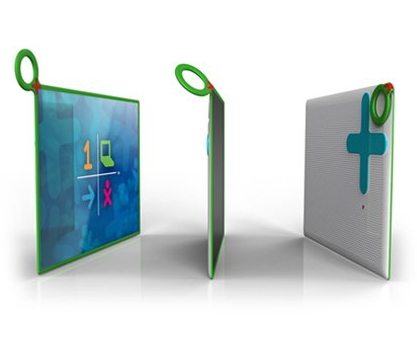 Its status as an icon for OLPC would be supplanted by the mesh-network antennas, or "ears." At the same time, Quanta Computer, our ODM, made a strong case for fitting the laptop with a so-called transformer hinge to simplify the machine's transformations from classic laptop, to game device, to e-book reader. In the spring of 2006, Yves Behar, the noted San Francisco industrial designer, came aboard to complete the final design of the Generation-One XO. In November of 2006, the first XO test machines, the B1 (Beta1), rolled off the Quanta assembly line in Shanghai. In early 2007, the B2 iteration of XO, stronger, sturdier, with a slight increase in tilt, was ready for its debut. B3 followed in May 2007, and pallets of B4 machines arrived in OLPC offices on July 6, 2007.